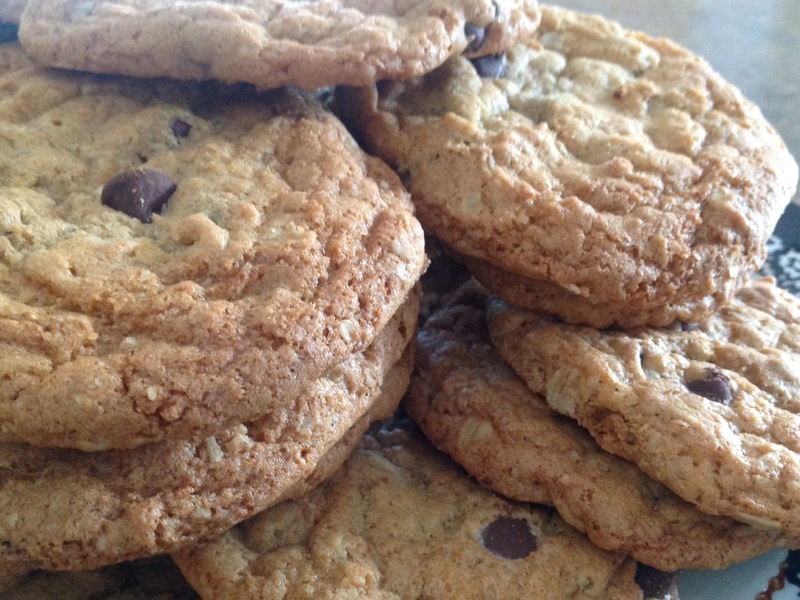 Crunchy on the outside, chewy in the middle…that’s how I would describe these awesome oatmeal chocolate chip cookies. Years ago, when I was a Daisy Girl Scout Leader, one of the Daisy parents gave me a sweet gift in a jar. She had stacked all of the dry ingredients for this cowboy cookie in a Mason jar and attached the recipe so that I could add a few ingredients to bake up a batch of these tasty delightful treats. I have tweaked the recipe a bit so that the cookie comes out flat with a crispy exterior and a chewy interior. This week, as the school year draws to a close, I made a huge double batch of these cookies to stuff into decorative gift bags and send off as teacher gifts to be passed out to all of our favorite teachers. I’ve attached a small gift card from Starbuck’s to complete the gift pack. Nuts are delicious in this recipe but I often leave them out when I’m not sure about the food allergies of those that will be consuming the cookies. I, myself, especially love them with chopped pecans. Give them a try, you won’t be disappointed! Preheat the oven to 350 degrees. In a large mixing bowl, combine flour, oats, baking powder, baking soda, and salt. In a medium bowl, cream the margarine, oil, sugar, and brown sugar. Beat in the eggs until well blended. Stir in chocolate chips and pecans. Drop by heaping tablespoons onto ungreased cookie sheets. ( I use an ice cream scoop for evenly shaped cookies.) Bake for 10-12 minutes or until golden brown around the edges. Transfer to wire rack after just a few minutes of cooling.